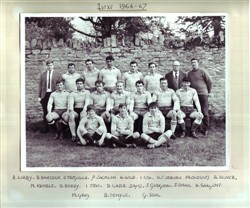 Olney RFC team photo 1966-67 season. The players (mostly in rugby kit) stand in 3 rows against a wall. and are named as: R Kirby, B Barcock, D Tregaskis, P Jackson, A Wild, I Cox, HJ Osborn (President), A Driver, M Kemble, D Boddy, I Tew, D Larr (Capt), J Gudgion, J Smail, R Sargent, M Gray, B Temple, G Soul.